Many central banks have used forward guidance in recent years to influence interest rate expectations, particularly when rates are at the effective or zero lower bound (ZLB) or close to it. Forward guidance is also seen as a useful tool for promoting a smooth adjustment when central banks are seeking to return policy rates to normal levels. Beyond clarifying the central bank's policy reaction function, forward guidance might cause market interest rates to be less sensitive to economic news if market participants take it as a firm commitment to follow a certain policy path.2 But if rates are already at or close to zero, measuring this effect is a challenge: market interest rates could be less responsive to news simply because monetary policy is constrained by the ZLB (Swanson and Williams (2014a)). In this special feature, we contribute to this debate in two ways. 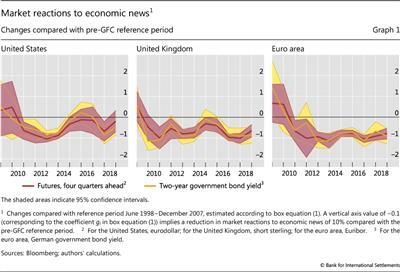 First, we show that short-term market interest rates have indeed become less sensitive to economic news since the Great Financial Crisis (GFC) in the euro area, the United Kingdom and the United States. We then quantify how the ZLB has affected market reactions to economic news in the United States, using estimated probabilities of hitting the ZLB derived from overnight index swap rates. We find that, for short maturities, a 10 percentage point increase in the ZLB probability is associated with a reduction of around 10% in the responsiveness of market interest rates to economic news. 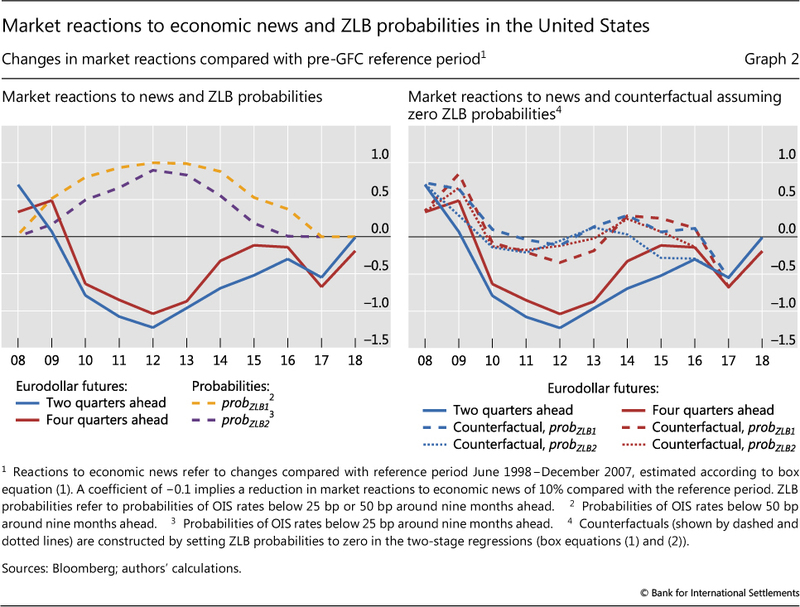 Constructing a counterfactual where the effect of the ZLB is absent, we estimate that the responses of market interest rates to economic news at horizons two and four quarters ahead would mostly not have been significantly below their pre-crisis averages. While suggestive, this finding does not definitely rule out that forward guidance played a role, as it could still be correlated with the ZLB probability or even influence it. Both forward guidance and a binding zero lower bound (ZLB) can influence how markets incorporate economic news into asset prices. While the ZLB was binding, variations in the probability of hitting the ZLB can account for the decline in the sensitivity to news of short-maturity interest rates. The role of forward guidance in this period remains difficult to assess. After policy normalisation started in the United States, significantly reducing the ZLB's probability, the response to news of short-maturity yields and some risky asset prices remained attenuated, suggesting that forward guidance had some effect during this phase. Second, we focus on the latest policy tightening phase in the United States, which has involved forward guidance about gradual policy rate normalisation. Here, we find that forward guidance has affected the market's sensitivity to news of short-maturity US government bonds as well as of some risky assets. 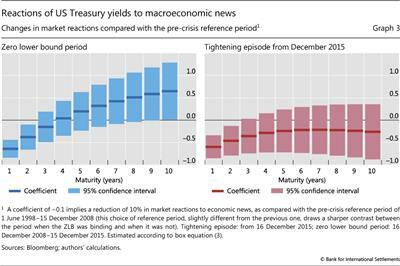 In particular, the reactions of bond yields to economic news during this period have been attenuated at shorter maturities (up to three years), but not at longer ones, as compared with the pre-crisis period. This raises two possibilities. Either forward guidance about gradual normalisation has had a larger impact than its ZLB-period counterpart, or the effect of forward guidance during the ZLB period was in fact material. To the extent that the 10-year interest rate has a prominent role in price discovery, our results suggest that forward guidance has not affected price discovery by market participants since the GFC. The rest of the article is structured as follows. In the first section, we discuss forward guidance as a monetary policy tool at the ZLB and during policy normalisation. In the second, we quantify the effects of the ZLB on market reactions to economic news. In the third, we focus on the period after policy normalisation started, and investigate how forward guidance about gradual policy normalisation may have affected market reactions to economic news. Forward guidance can take different forms. It can be open-ended - for example, a central bank might announce that "Interest rates are expected to remain low for an extended period". It can entail more concrete conditionality in terms of timing (date-dependent), eg "Interest rates are expected to remain at present levels at least through the summer of next year"; or in terms of economic developments (state-dependent), eg "Current policy is anticipated to be appropriate at least as long as the unemployment rate remains above 6.5%". Forward guidance can be quantitative or qualitative, depending on whether it provides specific figures or not. Whatever its form, forward guidance can influence public perceptions about the monetary policy reaction function and policy commitment, and thereby influence market prices and economic outcomes. The guidance could be more or less specific, but any perception that policymakers might renege on a prior commitment could undermine credibility. This is why flexibility, and hence conditionality, is an important part of any forward guidance. An unconditional commitment can tie a central bank's hands too tightly. If economic conditions warrant a deviation by the central bank from the stated path, the resulting damage to the central bank's credibility could hurt its effectiveness over the long term. All forms of forward guidance thus face a trade-off between the strength of the statement and flexibility. Unequivocal statements, by specifying more restrictive conditionality (for example, a clear date or threshold when the policy rate will be changed), signal a stronger and clearer policy intention. Thus, date-dependent forward guidance is arguably more constraining than the state-dependent variety, especially if the latter has many qualifications attached.4 State-dependent guidance offers more flexibility to respond to changing economic conditions, but may have a weaker impact on expectations, especially if the criteria for policy moves are viewed as subjective or qualitative. A key advantage of more restrictive conditionality is that it gives the central bank more influence over market prices. In some cases, a central bank may want markets to be less sensitive to economic developments - for example, during a period of heightened downside risks. During an easing phase, this can help a central bank maintain and strengthen the degree of policy accommodation. And in the early stages of normalisation, a more restrictive approach can help pin down market expectations, making for a more gradual adjustment in financial conditions. In this sense, some effect of forward guidance on market reactions to news may be intentional. These considerations suggest that one way of assessing market perceptions of the central bank's commitment to its forward guidance is to look at market reactions to economic news (Moessner and Nelson (2008)). The stronger the perceived intention to adhere to a certain policy rate trajectory (more restrictive conditionality), the more muted the response of market prices to news. Research findings on the relationship between forward guidance and market sensitivity to news have been mixed. There is some evidence that the pre-crisis forward guidance from the Federal Open Market Committee (FOMC) from late 2003 to end-2005 did not dampen market interest rate reactions to news (Moessner and Nelson (2008)). Bongard et al (2016) provide evidence that markets interpreted as conditional in nature the Fed's forward guidance about policy rates and FOMC members' Summary of Economic Projections (SEP) forecasts of the policy rate during the ZLB phase (from 2012 to 2015). There is also evidence from the cases of New Zealand and Sweden that market participants assign a degree of conditionality to their central banks' forward guidance (Moessner and Nelson (2008), Detmers and Nautz (2012), Moessner et al (2016)). The findings of reduced sensitivity to news post-crisis could reflect expectations of unchanged policy due to a binding ZLB. The ZLB could subdue market reactions to news even without any perception of policy commitment (Williams (2016), Swanson and Williams (2014a,b)).8 Since the policy rate cannot fall below the ZLB, news that would ordinarily induce the central bank to ease could not be reflected in interest rates over relatively short maturities. And the further away the central bank is from tightening, the more muted the response would be along the curve. Thus, if markets are indeed generally less sensitive to economic news at the ZLB (or the effective lower bound), this could make it more difficult to identify any distinct effects from forward guidance.9 In addition, forward guidance may be correlated with, or affect, the ZLB probability, further complicating the identification of any distinct effect of forward guidance. To understand the effects of the ZLB on market reactions to news, we directly estimate them. Our procedure, detailed in the box below, extends the analysis of Swanson and Williams (2014a), who compare market reactions during the ZLB era and previous periods. Specifically, we derive a measure of the market-implied probability of being at the ZLB based on the overnight index swap (OIS) market, and examine whether variations in this probability help explain changes in market reactions to economic news in the post-GFC period. The decision tree- based calculation of the ZLB probability, detailed in the box and its footnote 3, avoids several problems associated with parametric density estimation. Our empirical model produces estimates for changes in market reactions to news, relative to the pre-GFC period (June 1998−December 2007), which provides the baseline for "normal" market reactions. These changes (the coefficients gi in equation (1) in the box) are shown in Graph 1 for the United States, the United Kingdom and the euro area, where a value of −0.1 implies a reduction of 10% in market reactions to news, as compared with the average during the pre-GFC reference period. over a daily sample from 1 June 1998 to 17 December 2018, using non-linear least squares. Here, are daily changes in the market interest rate (we use two sets of interest rates: money market futures n quarters ahead, and government bond yields of a maturity of n years). dum2007+i(t) are yearly dummy variables, which are equal to one for every day in year 2007 + i, and zero otherwise, for i = 1,2, -, 11. The dummies thus cover the period when the ZLB was binding as well as thereafter. surprisei(t) is the actual data release of macroeconomic variable j minus its median survey expectation from Bloomberg, normalised by the standard deviation of the difference over the sample period. It is zero when t is not a data release date. Under specification (1), bj can be interpreted as the pre-GFC average market sensitivity to surprises in macroeconomic variable j, while (1 + gi)bj is the sensitivity to the same variable in year 2007+i. For example, a coefficient gi = −0.1 implies a reduction of 10% in market reactions to economic news in year 2007 + i, as compared with the pre-GFC reference period. 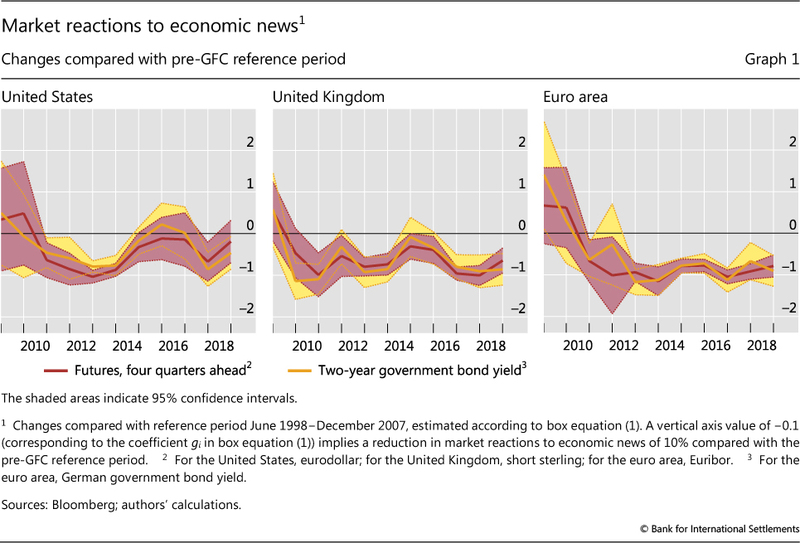 Estimates for gi are shown in Graph 1, which shows the extent of the decline in market reactions to news in the pre-GFC period. For robustness, we also consider an alternative measure, probZLB2,i, the probability of the US OIS rate being below 25 bp around nine months ahead. OIS-implied probabilities are obtained via rate decision tree calculations from Bloomberg based on OIS forward rates. At the end of each month, we aggregate the OIS-implied probabilities for the various rate levels below 50 bp (as well as 25 bp) at the FOMC meeting date around nine months ahead. The nine-month horizon is the longest one available from Bloomberg data, and allows us to gauge the extent to which the ZLB is binding, even in the earlier phase of the crisis. Table 1 shows the estimates for α and βi in specification (2), which quantify the impact of the ZLB probability on market reactions to news. Graph 2 shows the result from a counterfactual exercise where the ZLB effect is turned off. In the second empirical exercise, we zoom in on the normalisation period following liftoff from the ZLB where the policy rate is no longer constrained by the ZLB, at least in the very short run. Any reduction in the sensitivity of market interest rates to news is thus far less likely to be due to the ZLB effect. One caveat is that the probability of the ZLB binding again in future may still affect some segments of the market. As a robustness check, we also directly control for the previously used ZLB probability, which leads to results for the post-liftoff period that are very similar to the baseline specification below. for a sample period of 1 June 1998 to 17 December 2018, using non-linear least squares. Here, are daily changes in US Treasury yields of a maturity of n years, dum>2015(t) equals 1 during the recent US tightening episode from 16 December 2015 following liftoff from the ZLB, and dumZLB(t) equals 1 during the binding ZLB period of 16 December 2008 to 15 December 2015, and zero otherwise. surprisei(t) are normalised economic surprises in 10 US macroeconomic variables, as above. Estimates for gZLB and g>2015 are plotted in Graph 3, which compares market reactions to news during the binding ZLB period and during the latest policy normalisation period with those during the pre-GFC reference period. A coefficient g>2015 of −0.1 implies a reduction in market reactions to economic news of 10% in the recent US tightening episode, as compared with the pre-GFC reference period. Similarly, a coefficient gZLB of −0.1 implies a reduction of 10% in market reactions to economic news in the ZLB period, as compared with the pre-GFC reference period. The number of macroeconomic variables M is 10 for the United States (US non-farm payrolls, the ISM manufacturing index, the unemployment rate, retail sales, industrial production, housing starts, CPI inflation, hourly earnings, the trade balance and the advance GDP estimate). For the United Kingdom, we expand the set to include surprises in 10 additional UK macroeconomic variables (UK RPIX inflation, average earnings, the unemployment rate, retail sales, industrial production, producer price inflation, GDP, current account balance, trade balance and public sector borrowing requirement); and for the euro area, we use an additional four (euro area CPI inflation, the euro area unemployment rate, the Ifo German business climate index and German CPI inflation). Swanson and Williams (2014a) find that the sensitivity of US Treasury yields to positive and negative economic news fell by about the same amount at the ZLB. Intuitively, when the equilibrium interest rate is far below zero, short-term yields do not respond to small positive or negative shocks. Moreover, the response of longer-term yields is also symmetrical, partly since expected future short-term rates respond symmetrically to positive and negative shocks in periods when the ZLB is not binding. Calculations involve an interpolation of the OIS curve, which is then used to extract forward rates between any adjacent FOMC decision dates. These forward rates are used to infer the implied probability distribution of the OIS rate at each decision meeting, based on a binomial tree structure, as follows. For each meeting, two possible outcomes are assumed. For the nearest meeting, the first forward rate is bracketed by the two possible rate levels, whose probability- weighted average is equated to the forward rate. For the next meeting, four possible rates are considered and so on. For further details, see the Bloomberg Function XLTP XOIP. These ZLB probability estimates are available only from May 2002. Between May 2002 and end-2007, they were below 0.05 and 0.005 for probZLB1,i and probZLB2,i, respectively. 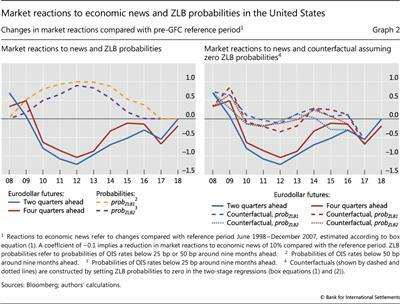 The estimated impact of ZLB probabilities in the United States on the market's reaction to news is significant (Table 1). For short horizons (two and four quarters ahead), a 10 percentage point increase in the ZLB probability nine months ahead is associated with a reduction of 7-13% in the responsiveness of market interest rates to economic news. For a longer horizon (eight quarters ahead), the ZLB probability has no significant effect. We construct a counterfactual news sensitivity measure for US interest rates using these estimates (Graph 2). In the absence of the ZLB effect, the response of short-dated interest rates to economic news would have been very similar to the pre-GFC historical average. Indeed, when one takes account of estimation uncertainty, the difference between the post- and pre-GFC sensitivity to news is largely statistically insignificant. While these results, taken at face value, point to the ZLB's importance in explaining the reduced market reaction to news, they do not conclusively rule out that forward guidance played a role. To begin with, the use of forward guidance is likely to be correlated with the ZLB probability, as it was precisely when conventional policy was constrained by the ZLB that such guidance was used. Moreover, forward guidance about the need for an extended accommodation could endogenously increase the ZLB probability. These positive interactions complicate the identification problem; and indeed, the empirical analysis here is not designed to disentangle the ZLB and forward guidance effects. Thus, the finding is only suggestive. However, the recent normalisation period provides an opportunity to gauge the impact of forward guidance that has been largely free from the ZLB influence. The next section turns to this assessment. We find that forward guidance about policy normalisation has significantly dampened the sensitivity to economic news of short-maturity US government bonds. This is shown in Graph 3, which plots changes in market reactions to news during the ZLB period and the normalisation episode, relative to the pre-crisis average reaction. As before, -0.1 implies a 10% weakening in market sensitivity to news compared with the reference period. 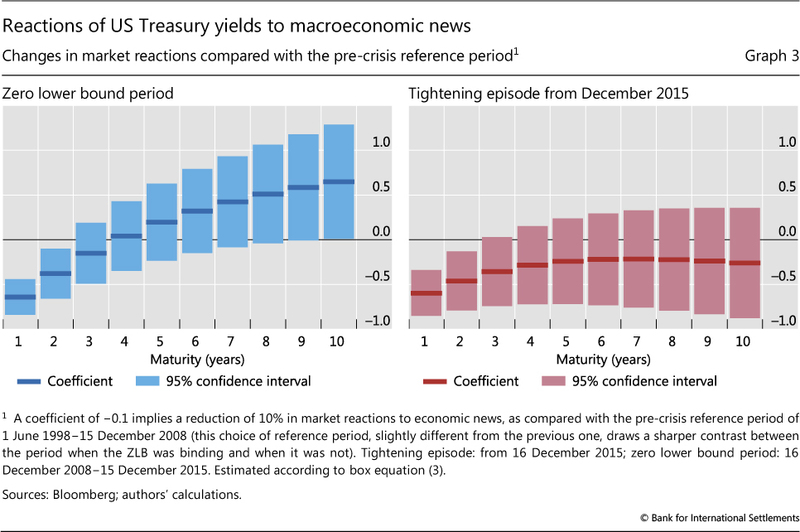 During the ZLB period, the reactions of US Treasury yields to economic news were significantly reduced at shorter maturities, but not at longer maturities (left-hand panel), consistent with the previous results. After the Fed started to raise policy rates, US government bond yields at longer maturities reacted to economic news no differently than they did during the reference period, but sensitivity is dampened for Treasuries with maturities of one to two years (right-hand panel).12 To the extent that the 10-year interest rate has a prominent role in price discovery, our results suggest that forward guidance has not affected price discovery by market participants after the GFC. However, some risk spreads have become less sensitive to news since December 2015. Applying the same methodology to a variety of risk measures, credit spreads and equity indices, we find evidence of a reduction in the sensitivity of some US and euro area risk measures to economic news in the recent US tightening episode (Table 2). This might reflect a broad increase in risk-taking. At the same time, the evidence does not yet give a definite answer as to which risk spectrum is likely to be more affected. More research is still needed to ascertain how forward guidance affects different classes of financial market risk. We find that the ZLB helped dampen the response of short-term market interest rates to news after the GFC. These results support the conclusions of Swanson and Williams (2014a) and Williams (2016). For short maturities, a 10 percentage point increase in the ZLB probability was associated with a reduction of around 10% in the responsiveness of market interest rates to economic news. When we construct a counterfactual that corrects for the effect of the ZLB, we find that, in the absence of this effect, market reactions to economic news at horizons of two and four quarters ahead would mostly not have been significantly below their pre-crisis average. Studying the recent episode of US policy normalisation allows us to isolate the effect of forward guidance on these market reactions, since the effect of the ZLB is largely absent. We find that bond yield reactions to news have been weakened at shorter maturities of up to three years, but not at longer maturities. It thus appears that forward guidance has affected market reactions to news in the US government bond market at short maturities during the recent tightening episode, but not at longer maturities. To the extent that the 10-year interest rate has a prominent role in price discovery, our results suggest that forward guidance has not affected price discovery by market participants since the GFC. Taken at face value, these findings seem to suggest that the effect of forward guidance on market reactions to news has become more discernible in the recent normalisation period. One possible explanation is that forward guidance about gradual policy normalisation may have been associated with a stronger perception of policy commitment, given that central banks may use such guidance to prevent yields from overshooting. Alternatively, the ZLB and forward guidance effects may both have dampened the market's sensitivity to news during the ZLB period. Disentangling these effects is a challenge, especially since the two may be correlated and forward guidance may affect the ZLB probability. Nevertheless, this would be a fruitful topic for future research. Adrian, T, R Crump and E Moench (2013): "Pricing the term structure with linear regressions", Journal of Financial Economics, vol 110, October, pp 110-38. Bauer, M and G Rudebusch (2014): "The signalling channel for Federal Reserve bond purchases", International Journal of Central Banking, vol 10, no 3, September, pp 233-89. Bongard, M, G Galati, R Moessner and W Nelson (2016): "Connecting the dots: market reactions to forecasts of policy rates and forward guidance provided by the Fed", DNB Working Papers, no 523. Borio, C and A Zabai (2018): "Unconventional monetary policies: a re-appraisal", in P Conti-Brown and R-M Lastra (eds), Research Handbook on Central Banking, Edward Elgar Publishing, pp 398-444. Also published as BIS Working Papers, no 570. Coenen, G, M Ehrmann, G Gaballo, P Hoffmann, A Nakov, S Nardelli, E Persson and G Strasser (2017): "Communication of monetary policy in unconventional times", ECB Discussion Papers, no 2080. Detmers, G-A and D Nautz (2012): "The information content of central bank interest rate projections: evidence from New Zealand", The Economic Record, vol 88, no 282, pp 323-9. Feroli, M, D Greenlaw, P Hooper, F Mishkin and A Sufi (2016): "Language after liftoff: Fed communication away from the zero lower bound", report prepared for the 2016 US Monetary Policy Forum, 26 February. Moessner, R, J de Haan and D Jansen (2016): "Effectiveness of monetary policy in Sweden", Contemporary Economic Policy, vol 24, no 4, pp 698-709. Moessner, R, D Jansen and J de Haan (2017): "Communication about future policy rates in theory and practice: a survey", Journal of Economic Surveys, vol 31, no 3, pp 678-711. Moessner, R and W Nelson (2008): "Central bank policy rate guidance and financial market functioning", International Journal of Central Banking, vol 4, no 4, pp 193-226. Shin, H S (2017): "Can central banks talk too much? ", speech at the ECB conference on Communications challenges for policy effectiveness, accountability and reputation, Frankfurt, 14 November. Stein, J (2014): "Challenges for monetary policy communication", remarks to the Money Marketeers of New York University, 6 May. Swanson, E and J Williams (2014a): "Measuring the effect of the zero lower bound on medium- and longer-term interest rates", American Economic Review, vol 104, no 10, pp 3154-85. --- (2014b): "Measuring the effect of the zero lower bound on yields and exchange rates in the UK and Germany", Journal of International Economics, no 92, pp S2-S21. Williams, J (2016): "Discussion of 'Language after liftoff: Fed communication away from the zero lower bound'", presentation at the 2016 US Monetary Policy Forum, 26 February. Woodford, M (2012): "Methods of policy accommodation at the interest-rate lower bound", paper presented at the Federal Reserve Bank of Kansas City Jackson Hole symposium on The changing policy landscape, 31 August- 1 September. 1 We would like to thank Claudio Borio, Stijn Claessens, Benjamin Cohen, Ingo Fender, Gabriele Galati, Benoît Mojon, Hyun Song Shin and Christian Upper for useful comments and discussions. We would also like to thank Burcu Erik for excellent research assistance. The views expressed in this article are those of the authors and do not necessarily reflect those of the BIS. 2 It is difficult to determine whether this reduced sensitivity is desirable from the policymaker's perspective, which ultimately depends on the underlying objective of forward guidance. We do not attempt any normative analysis in this article. 3 See Borio and Zabai (2018) for a review of existing evidence on various unconventional policy measures introduced post-GFC; and Moessner et al (2017) for a review of the theory and practice of forward guidance. 4 The Federal Open Market Committee (FOMC) has changed the nature of its forward guidance over time and as conditions have evolved. It deployed open-ended forward guidance starting in December 2008, subsequently shifting to date-dependent guidance and then to state-dependent forward guidance. Since December 2015, the FOMC has provided guidance that policy rate normalisation will be gradual. 5 See Stein (2014) and Shin (2017). 6 Any discrepancy between central bank guidance and market expectations may simply be a reflection of market participants doing their own price discovery (eg on balance having a different macroeconomic outlook from the central bank's). At the same time, a very prolonged and persistent gap may test the central bank's credibility. 7 They consider periods when the policy rate was at or below 1% in Canada, the Czech Republic Germany, Italy, Japan, Norway, Sweden, the United Kingdom and the United States. 8 Central banks can resort to unconventional monetary policy tools at the ZLB, eg quantitative easing, which may also affect the reaction of yields to news. This could explain evidence that longer-term market rates continue to respond to macroeconomic news at the ZLB even when short-term rates do not (Swanson and Williams (2014a)). 9 Swanson and Williams (2014a) document empirical findings consistent with these predictions. They also show analytically that the ZLB would weaken market interest rate reactions more at the short end of the curve, where the effect of a binding ZLB is stronger. 10 Williams (2016) makes a similar observation. 11 The findings remain largely the same if one controls for the ZLB probability nine months ahead, as in the previous section (the probability, albeit small, was still positive early in the normalisation episode; see Graph 2, left-hand panel). 12 Further analysis shows that the term premium component of long-term yields (with maturities of two years or higher), the part that reflects the risk appetite of investors, has not become less sensitive to news since the liftoff from the ZLB. The term premia are calculated based on Adrian et al (2013). The results are available from the authors on request.